It had been over a year since I saw my mom so I was thrilled when my parents booked flights to Auckland! Their vacation style is different from mine so I anticipated a busy week. In Auckland I am comfortable playing tour guide, but outside the city is still foreign and this would be my first time as the primary driver in a country where we drive on the left. I knew it would be stressful but was still eagerly counting down the days until their visit. We finalized most plans beforehand so were able to hit the ground running. On Thursday morning we were at the car rental when they opened and after negotiating an automatic transmission we were on our way. Our first stop was Mount Manganui in Tauranga, 3 hours east of Auckland. My parents and I hiked around the base of the mountain, finishing at noon. Backtracking into town, we drove to the Mount Brewing Co. for lunch and then hit nearby Ocean Beach to lay in the sun. 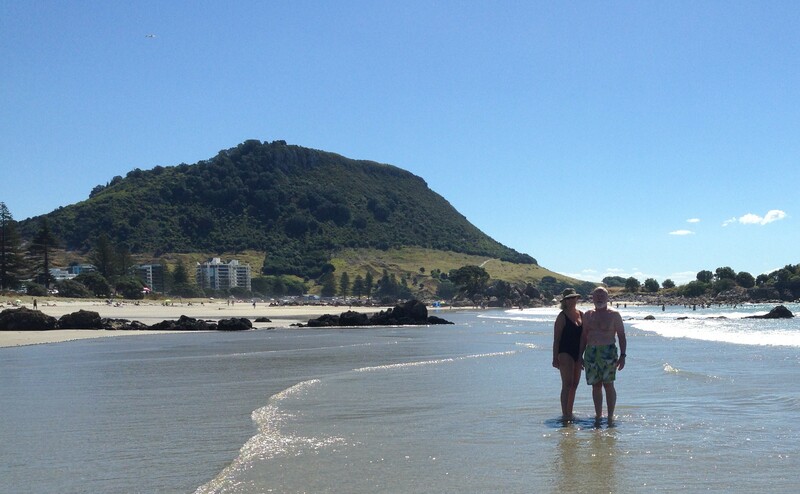 My dad was the only one brave enough to take a dip in the cold water – his first in the South Pacific Ocean. The area around the Mount was compact and if we had more time we could have done all these activities without getting back in the car. Before long we were back on the road, driving an hour south to Rotorua. After checking into our hotel we went to the night market for dinner and a taste of Kiwi culture. Overnight my dad’s CPAP machine overheated his converter so we had to find a new one. 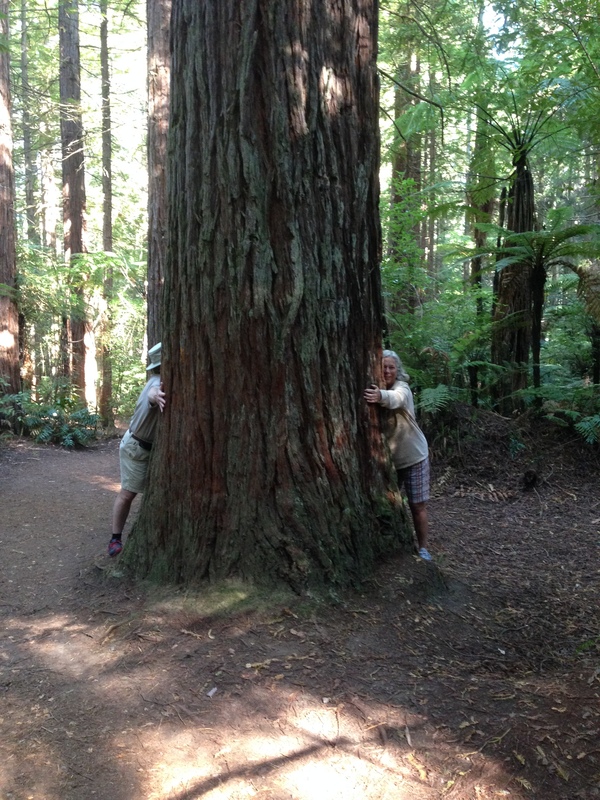 After a morning stroll through the beautiful redwood forest we went in search of one. Three stores and $100+ later the problem was resolved and it was time to eat. We went to Third Place Cafe for a delicious late breakfast on their patio. (If you’ve read my other posts you’ll notice I stop at this place every time I’m in, or near, Rotorua.) Next, I dropped my parents at Te Puia for a Maori cultural performance and tour of the geyser, bubbling mud, and kiwi house. I did not join them because I had already been, but their tour was significantly longer and more thorough than mine. We arrived at the Polynesian Spa an hour before my appointment. It was enough time to soak in the hot pools before my mud massage. During this 60-minute treatment my back was exfoliated and warm mud was painted on it. As the mud worked its nourishing magic I enjoyed a scalp massage. Finally, the mud was wiped away and oils massaged into its place. A heavenly treatment that left me completely relaxed and unphased when my mom told me about her disappointing one. Polynesian Spa did what they could to rectify the situation and I think the three of us left as happy customers. Meanwhile, Allen hopped on the InterCity bus after work and met us in Rotorua in time for dinner. The next morning we left early for Hawkes Bay. After 3.5 hours of winding our way through the middle of the North Island we arrived at the first of seven wineries. Upon recommendation we had canceled our bike tour and decided to drive. This allowed us to cover a larger area including Gimblett Gravels, known for its peppery syrah. By dinnertime at Mission Estate Winery we’d had enough wine for one day! The following morning we celebrated a memorable mass at St. Patrick’s where the priest embraced the weekend’s art deco theme and reminded us of the church’s progress in the last century. 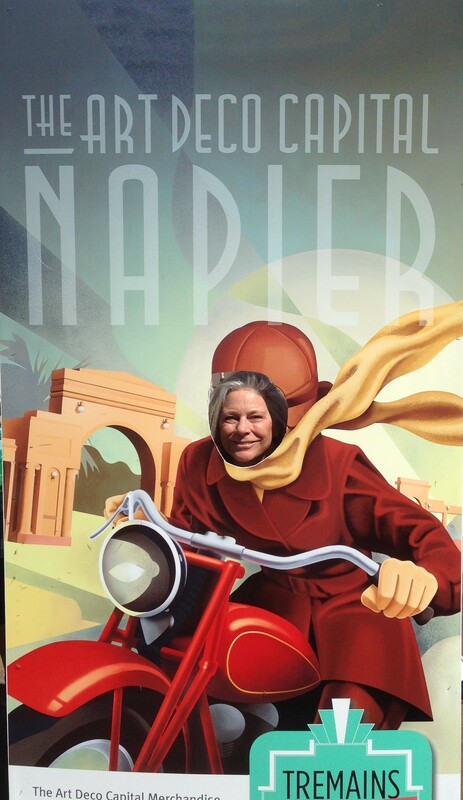 Since we were in town we decided to check out the art deco festival. We saw old model cars and trains and a box car race, but I was most impressed with the fashion. I was amazed at how eagerly the locals participate – ladies with their flappers and headpieces; and adorable little boys in suspenders and driving caps. Sunday morning we learned that our nighttime kayak trip was cancelled due to an imminent cyclone. Seeing glowworms is a uniquely New Zealand experience that I did not want my parents to miss. We brought them to the Waitomo Caves; it was a little out of the way so unfortunately we spent most of Sunday in the car. silver fern rotorua was clean and very nice suite hotel with jacuzzi on private patio; only down side is that it’s a 2k walk to town so would recommend this place only if you have a car. 806 motor lodge hastings was fine for what we needed – a crash pad after a day of wine tasting, but it was basic and a bit run down. we were lucky to find it because everything else was booked due to the art deco festival. if a hostel is available I would stay there instead. glowworm kayak tour was cancelled so we brought mom and dad to waitomo caves instead.